Named for the Native American tribe, the Penobscot River has a history as a colonial trade route and the delivery system for the logging industry in Maine during the hay-day of river driving. With its 4 branches and main stem it is reported to be about 350 miles long. The Penobscot originates from large northern Maine lakes and drains an immense area of northern Maine. Several other river system drain into the Penobscot such as the Mattawamkeag River, the Piscataquis River and the Passadumkeag River. One could spend a lifetime exploring the Penobscot and its many branches. The north and south branches are in a remote wilderness part of Maine. Getting there requires a long drive over access controlled logging roads. The land owner association that owns these roads charges a nominal fee at the gates managed by North Maine Woods (www.northmainewoods.org) and also maintains many camp site locations along these stretches of river which they also charge a small fee for. This is a scenic area that will appeal to hikers and photographers. 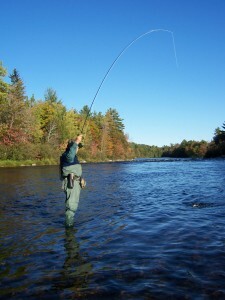 The river has a wild population of brook trout and landlocked salmon. The ruffed grouse hunting in this part of main is legendary. The north and south branches feed into the West Branch. This area is mostly owned by large institutional landowners. You can't find much land to buy here unless you are in the market for the occasionally offered township. 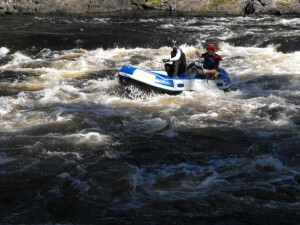 The West Branch of the Penobscot is THE whitewater river in Maine. The river segment beginning at McKay Station in the Ripogenus Gorge to Debsconeag Falls has a commercial rafting industry that thrills thousands every year. This section of river is also world known for its challenging fly fishing for wild landlocked salmon. This area is also mostly owned by large landowners and with much conservation easement you will rarely find any property for sale in this section with the exception of a few camps or cabins on leased land. The upper reaches of the East Branch of the Penobscot is wild brook trout heaven. This section is a very scenic canoeing hotspot with views of Mount Katahdin and the other nearby mountains. Those canoeing this section should plan ahead for portages around a few tricky falls. Buyers looking for a camp or home site can occasionally find land for sale at the lower end of the East Branch. The West and East Branches of the Penobscot come together in Medway to form the main stem of the river. From this point to the Atlantic Ocean is where you will find many small and large land parcels for sale. Prices here will vary greatly depending on the quality of the waterfront. From Medway to Old Town the river is noted as one of the best smallmouth bass fisheries in the United States. The river still has a small protected run of Atlantic salmon, sorry no fishing allowed for them at this time. A recent restoration project in the Bangor area has breached a number of old dams and has reopened the river to runs of shad, alewives and other anadromous species. This segment of the river is also a great spot for boating including trips from Bangor to the open ocean. The Penobscot River is my favorite Maine river. If you come to Maine to buy land or just to enjoy the outdoors be sure to put it on your list of places to visit.